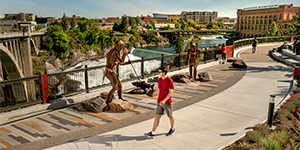 In the heart of the Inland Northwest, with over 721,873 residents, the Spokane, Washington, area provides numerous business and technical internships as well as cultural and artistic activities. Campus is a 15-minute walk along the Spokane River from downtown, offering a variety of shopping, dining, and entertainment choices. Our location provides four seasons of fun, with easy access to dozens of lakes, several ski resorts, and other outdoor adventures. Colleges, programs, and degrees: Gonzaga consists of five undergraduate schools and several graduate programs. Complementing the College of Arts and Sciences are the Schools of Business Administration, Education, Engineering and Applied Science, Law, Leadership Studies, and Nursing and Human Physiology. Gonzaga offers 75 undergraduate programs of study, 23 master’s degrees, select doctoral degrees, and a Law school. international student services: Full orientation pro-gram, Intercultural Student Union, airport pickup, immigration and academic advising, international student activity program, career services, internships, etc. Test score requirements: TOEFL: 80 iBT; IELTS: 6; SAT (EBRW+M): 1150 (score not required for international applicants); ACT: 23 (score not required for international applicants); applicants with a TOEFL score of 72–79 or 5.5 IElTS may qualify for Gonzaga’s Global Bridge Program. Application fee: Waived—please contact iadmissions@gonzaga.edu for international student application fee waiver instructions. Deposits and fees: A $400 confirmation deposit is required to secure your place in the class and initiate your course registration. the 18th-best undergraduate Engineering program nationwide. 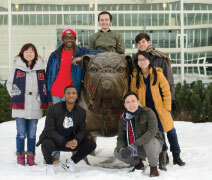 Gonzaga’s Global Bridge Program: Students who do not currently meet Gonzaga’s English-language proficiency requirements (80+ TOEFL iBT, 6+ IElTS) can still be admitted to Gonzaga through the Global Bridge Program. The program provides comprehensive academic, language, and cultural support to international students as they transition into their degree programs. The first level of the program enables students to improve their English proficiency while earning 12 undergraduate credits at a highly discounted tuition rate. Gonzaga also offers one of the best academic ESL programs in the nation. Please contact iadmissions@gonzaga.edu for more information. Numerous facts and figures attest to the value of a Gonzaga education: exceptional acceptance rates into prestigious graduate programs, including medical and law schools; one of the highest CPA exam pass rates in the nation; job placement in corporations such as Microsoft, Boeing, Nike, and Amazon; and consistently glowing reviews in national publications such as U.S. News & World Report, The Princeton Review’s The Best 381 Colleges, Barron’s Best Buys in College Education, and Kiplinger’s 100 Best Values in Private Colleges. Gonzaga is committed to educating the whole person. Our core curriculum encourages all students to engage in interdisciplinary learning, critical thinking, and self-reflection. The core includes first-year and senior seminars as well as courses in philosophy, religious studies, writing, science, the humanities, social justice, global studies, and fine arts. Multilingual courses that integrate international and domestic students are available as part of the core. Ultimately, the core challenges students to integrate their studies and actions into a philosophy of living that promotes a lifetime of learning. Gonzaga is a comprehensive liberal arts university that offers English as a Second Language courses, a Global Bridge pathway program, and degrees at the undergraduate, graduate, law, and doctoral levels. Gonzaga’s 5,192 undergraduates choose from more than 75 majors and programs to reach their academic dreams. An average class size of 24 allows faculty to closely mentor students who thrive in classrooms run only by faculty. Distinctive opportunities include the Comprehensive Leadership Program, a simulated stock exchange finance lab, engineering work-experience projects, and facilitated networking opportunities both locally and nationwide. Gonzaga requires freshman and sophomore students to live on campus in one of 21 residence halls and apartment buildings. Residence Life is the foundation upon which Gonzaga’s strong sense of community is built. International students are encouraged to live in Coughlin Hall, a living-learning community where international and domestic students on the Global Citizenship floor experience and learn about cultures, languages, and religions different from their own. Juniors and seniors may live on campus or in the surrounding neighborhood. 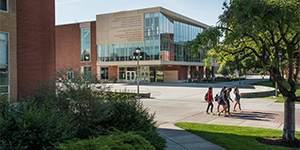 The John J. Hemmingson Center houses multiple dining services, the Center for Global Engagement, the Center for Community Engagement and Service Learning, Unity Multicultural Education Center, the Center for Experiential Learning, Gonzaga Outdoors, study and recreational lounges, and student club offices. Campus life is an exciting and adventurous blend of meeting the challenges brought on by maintaining a rigorous academic schedule while fully embracing the vibrant social atmosphere of spending time with close friends. Campus life includes the opportunity to participate in GU’s 150+ student clubs and organizations. Activities are available in areas such as music, theater, cultural clubs, community service, student government, Division I athletics, and club and intramural sports. Whether traveling as part of Gonzaga’s nationally recognized debate and mock trial programs, planning the annual Intercultural Student Union dinner, or writing for GU’s weekly newspaper, students always find they have the opportunity to showcase creativity and leadership outside the classroom. The Gonzaga Student Body Association also sponsors numerous events throughout the year, including dances, ski weekends, boat cruises, and much more. The Martin Center offers racquetball, basketball, an indoor running track, a swimming pool, and a state-of-the-art fitness facility open to all students. Merit-based scholarships are offered to international students without consideration of financial need. Students are automatically considered for these merit scholarships when they apply for admission. The Center for Global Engagement Diversity Scholarship is specifically for international students and, like a handful of other scholarship opportunities, requires a separate application. Please visit gonzaga.edu/ischolarships to learn more.